Some time ago NVIDIA released the average performance level video card geForce 8600 GTS, based on g84 chip , which was differed from high end solution based on g80 in terms of too small quantity of ALU and TMU units, in comparison with the expected speed level, the card has a comparatively low performance. Speed deference between the GeForce 8800 GTX and GeForce 8600 GTS was too great. Later, AMD and NVIDIA companies released higher level video card : GeForce 8800 GT and RADEON HD 3870, but for AMD the low-end model HD 3850, was intended to compete with GeForce 8600 GTS. Naturally, the more advanced technical process and great advantage in term of time, gave AMD solution advantage in performance, and HD 3850 proved to be faster than GeForce 8600 GTS in many applications. One week ago NVIDIA company announced the g94 chip , based on the updated G9x architecture . The new solution was arranged between 8800 GT and 8600 GTS, the video card geForce 9600 GT is based on G94, which differ from G92 only in terms of smaller quantity of shader processors and textural blocks, bringing the support of 256- bit system bus memory in video card witch cost less than $200. So the g9x chips were based on geForce 8 (G8x) architecture and it include all its advantages: the standardized shader architecture, complete support to directx 10 API, qualitative anisotropic filtration and CSAA up to sixteen . The distinctive special features of new chips : some blocks was changed in the best side (TMU, ROP, PureVideo HD), and also the production technology : 65 nm, which allow to reduce the prime cost and also allow the release of such powerful solutions in average price range. New mid-end NVIDIA video card differ a lot from previous geForce 8600 GTS, there is a doubly larger quantity of : ALU, ROP and TMU, and higher frequency. 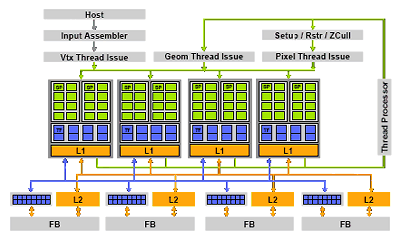 Almost twice increased video memory capacity , in addition to the 256- bit system bus. The new geForce 9600 GT possesses the approximately twice higher power in all parameters. From architectural side g94 differ from G92 only in terms of quantitative characteristics. The g9x chips is the slightly modified g8x, transferred in new technical process with small architectural changes. New mid-end chip has 4 large shader block (only 64 ALU) and 32 textural blocks, and also four wide ROP. Let us pause at some architectural changes in G9x again. Textural blocks in G94 are the same as in G84/g86 and G92, they know how to select doubly more bi-linear filtered samples from the textures, in comparison with G80. The number of textural block in geForce 9600 GT in real application will not work faster than 32 blocks ( GeForce 8800 GTX ) only due to the larger operating GPU frequency . Such note can be observed only during turned-off tri-linear and anisotropic filtration, which is extremely rare. There is one additional advantages Of g9x and GeForce 9600 GT in particular, NVIDIA company used certain new compression technology , realized in ROP blocks , which, according to their estimation, works 15% more effective than in previous chips. Apparently, this exactly the most architectural modifications in G9x, intended for guaranteeing larger effectiveness in works with the 256- bit memory system bus , in comparison with 320/384- bit. Naturally, in real applications there is no large difference , even according to the NVIDIA data increase from ROP update most frequently is only about 5%. In spite of all changes in g9x architecture , adding complexities to chip, the number of transistors in one chip is great. Probably, this GPU complexity is explained by the inclusion of separate NVIO chip , complication of blocks TMU and ROP, and also other modifications: change in caches sizes , etc. G94 is build using the same second generation video processor , G86 known on G84/and G92, which is characterized by the improved support Of pureVideo HD. It almost completely unloads CPU with the decoding of majority extended video data types , h.264, VC-1 and MPEG-2, with resolution up to 1920x1080 and bite rate up to 30-40 Mbit/s. VC-1 decoding in NVIDIA solutions was not so effective as H.264, the small process part uses central processor power , but this allow to preview all existing HD DVD and Blu-Ray disks even on average computers. The last update in pureVideo HD is the double-stream decoding, dynamic change in contrast and color saturation. These changes are not exceptional for GeForce 9600 GT, and in new drivers versions , beginning from ForceWare 174, they are introduced for all chips, which total support to hardware acceleration with the aid of PureVideo HD. Double-stream decoding allow to accelerate decoding due to the use of two different thread for video data simultaneously. This can be usefully with regimes as ( picture- in picture ), which are used in some Blu-Ray and HD DVD disks . The last useful update in the last pureVideo HD version became the possibility of simultaneous work with aeroshell in Windows vista operating system during the playback of hardware accelerated video in window regime. The support of external interfaces in GeForce 9600 GT is analogous to GeForce 8800 GT, with exception of integrated display-Port support . 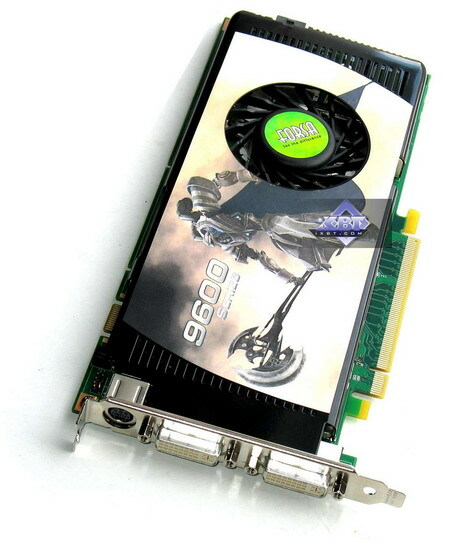 In Reference video cards GeForce 9600 GT are installed two Dual link DVI with HDCP support . HDMI and Display-Port Support is realized by hardware chip. Moreover, as NVIDIA assures , in contrast to G92, the support Of display-Port is now build in the chip and the external transmitters is not required. Generally, HDMI and Display-Port port on video card are optional. Now let us pass to the tested video card : we used some geForce 9600 GT from BFG, ECS, Forsa, Galaxy, Point of view (PoV) and Zotac production . All Video accelerators, except those from PoV and Forsa, have high frequencies . Support multiprocessor work: SLI (Hardware). Call Of juarez (Techland/ubisoft) : directX 9.0, shaders 3.0 (HDR), demo (advanced on maximum quality ). S.T.A.L.K.E.R. 1.003 (GSC game world/THQ) : directX 9.0 . maximum ( DYNAMIC ILLUMINATION). CRYSIS 1.1 (Crytek/EA), DirectX 9.0c/10.0, shaders 3.0/4.0, MS Windows vista - Very high (DX10), Windows XP - High (DX9), ( two levels RESCUE and HARBOR). Company Of heroes (Relic entertainment/ THQ) : directX 9.0, shaders 2.0, maximum quality. Hard disk WD caviar SE WD1600JD 160GB SATA. Power unit tagan 1100-U95 (1100W). Drivers : ATI version CATALYST 8.1; NVIDIA version 169.28/174.12. Well it is possible to say immediately that the Geforce 9600 GT was faster not only then RADEON HD 3850, but also perform better then HD 3870. The 9600 GT is positioned as 8800 GT competitor! In general AMD has to reduce prices in order to make their card competitive. The direct 9600 GT competitor from AMD is here the HD 3870 witch is more expensive. It is clear that a the beginning the selling-prices will be strongly overstated, and the 9600 GT for sure will cost as much as RADEON 3870 or just below; But over time the price will be stabilised since the price niche for 9600GT is below 200 US dollars (170-180). 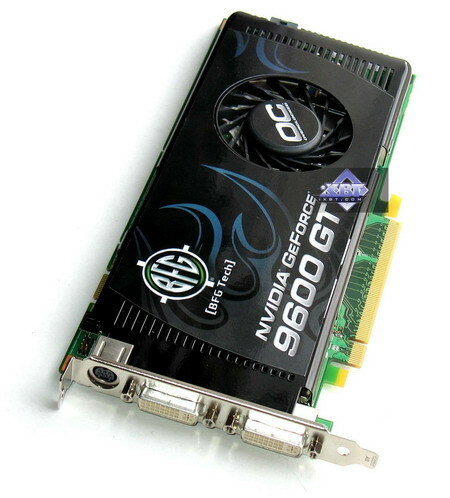 We also note the high frequencies for video card 9600 GT . Now let us talk about each card separately. 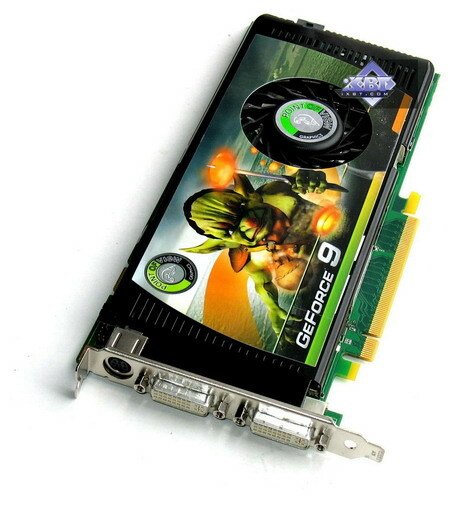 BFG geForce 9600 GT OC 512MB PCI- E - standard reference (produced by NVIDIA, while BFG buys only these card), which has slightly higher frequencies. ECS geForce 9600 GT Accelero edition 512MB PCI- E - This card is equipped with unique cooling system. This version is examined as the most successful, if we do not consider the highest frequencies . 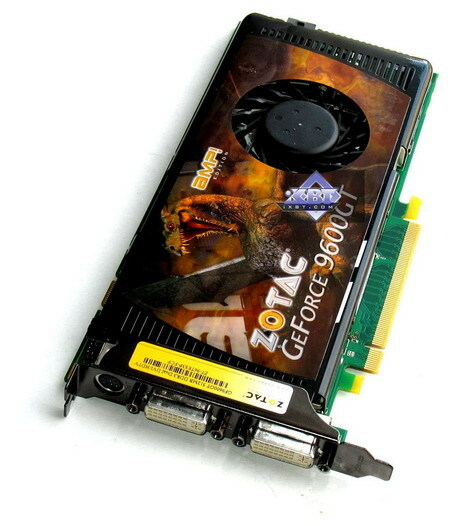 Forsa geForce 9600 GT 512MB PCI- E - also standard reference. In general, you to look at the prices and compare. If price will be adequate, then the selection will be not bad . 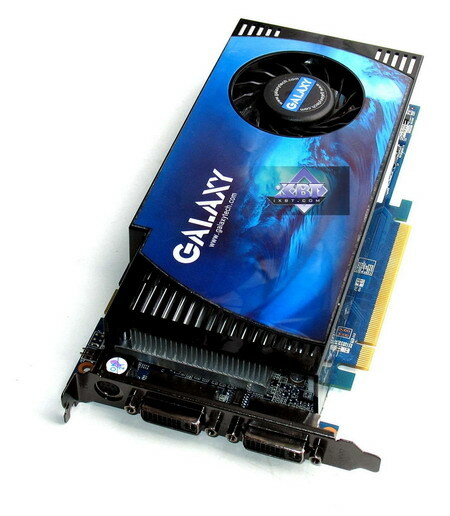 Galaxy Geforce 9600 GT overclocked 512MB PCI- E - is also equipped with unique cooler . Here everything is corrected, the cooler became noiseless, and also completely effective. Point Of view geForce 9600 GT 512MB PCI- E - standard reference . It is necessary to check the prices, since delivery set is entirely standard. Zotac geForce 9600 GT AMP! 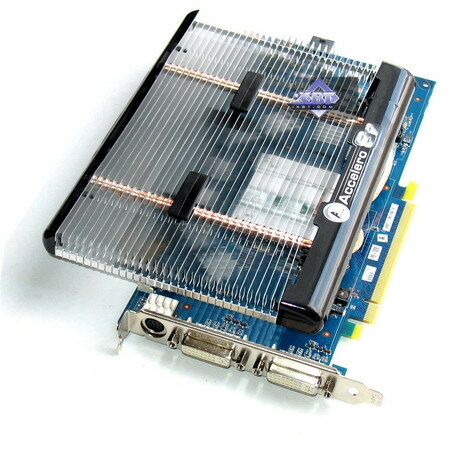 Edition 512MB PCI- E - This is also reference card .This product is very interesting due to the high frequencies , which allows in some tests to overtake even the 8800 GT . If performance is a must then this product will be the best selection among 9600GT!